These beach-friendly speakers keep your MP3 player safe inside a sand- and water-resistant compartment. You're out enjoying a beautiful day at the beach. Swimmers are off bobbing in the waves, while, closer in, children splash in the foam and build sand castles. You sit propped on your towel, dreamily taking it all in--but something is still missing. A day at the beach just isn't complete without the right musical soundtrack. The Beach Sounds portable sound system means that you can now rock out at the beach without fear of getting water or sandy grit into your electronics. With its sunshiny colors and retro styling, this amplified speaker set has a water resistant body in which you can conceal your MP3 player, smartphones or Walkman. Inside, foam rubber and a Velcro strap protect your electronics from being jostled around. The audio jack fits most standard media players, and can be threaded through a pluggable hole in the back for external input. There’s even a built-in FM/AM tuner, so you can catch some radio waves. Made in China. Device is water resistant, but not waterproof, and should not be immersed in water. Compatible with all models of iPod and iPhone. My mom was very happy with this product and can't wait to use it at the beach. She says the speaker is loud and loves that it keeps the sand away from her phone. The only thing is if your phone is in the speaker there is no convenient way to change the song or answer your phone or messages. 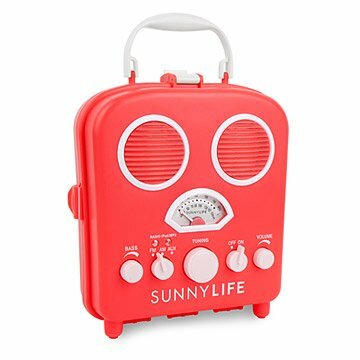 I purchased this for my daughter's 12th birthday, I wanted her to have a radio that was tough enough to be dragged outside, to the beach, through the house and everywhere in between. This definitely did the trick! Love the retro styling, coral coral color, sunny life logo and durable construction. MP3 player easily fits inside securely to blast your favorite tunes or gold school and use the radio which functions just as well. Great sound for such a small speaker system, I highly recommend this product! I got this for a friend. I know she'll love it because she loves mine! I debuted mine last summer on a beach getaway. Gave to my daughter for her birthday. She wants to use to listen to music in the shower while protecting her phone from humidity. Unfortunately the dial that switches from radio to aux etc. does not work. Planning to exchange but not optimistic. Seems like a poorly made item. Makes using your phone as a music player easier and adds a radio optionas well. It actually looks better in person then the photo presents. We are very happy with out purchase. Got this as a gift and I love this speaker system. People smile at it. It plays and protects my MP3. I have a few boom boxes before this and they stopped working because of the sand. This Great speaker system never gave me a problem, and never failed me. The reviewer that talked about static - I changed the batteries and it worked perfect. I have had it now 3 Beach seasons and besides fading, it still works perfectly. GREAT toy - thanks!!!!! Great for the beach and unique! !